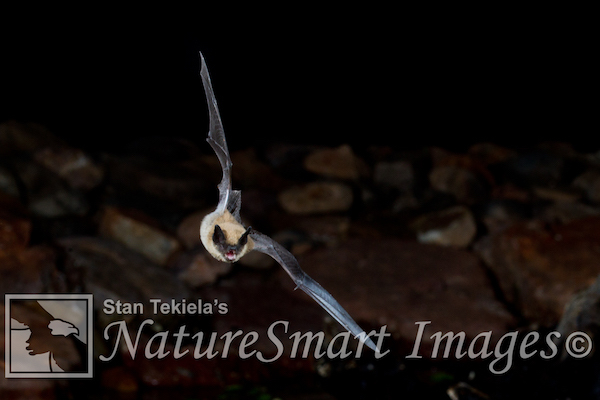 Naturalist and wildlife photographer Stan Tekiela shares how he captured the ultrasonic sounds of the bat in flight. As I turn off the main paved road onto the dirt mountain road, my headlights sweep across the rouged, rocky nighttime landscape. With each switchback I gain altitude, going higher and higher into the Arizona mountains. Recent rains have left sections of the dirt road washed out and very rocky, making it difficult to navigate. I need to slow down to a crawl and steer my truck through the large exposed rocks that now constitute the road. Several miles later, I pull into a small roadside pull-out, just beyond a dry creek bed. Stepping out of my truck and into the moonless night, the darkness completely envelopes me. Above, the night sky is a blanket of stars. Millions of stars stretch from horizon to horizon, and the Milky Way Galaxy paints a white swath across the middle of the sky. 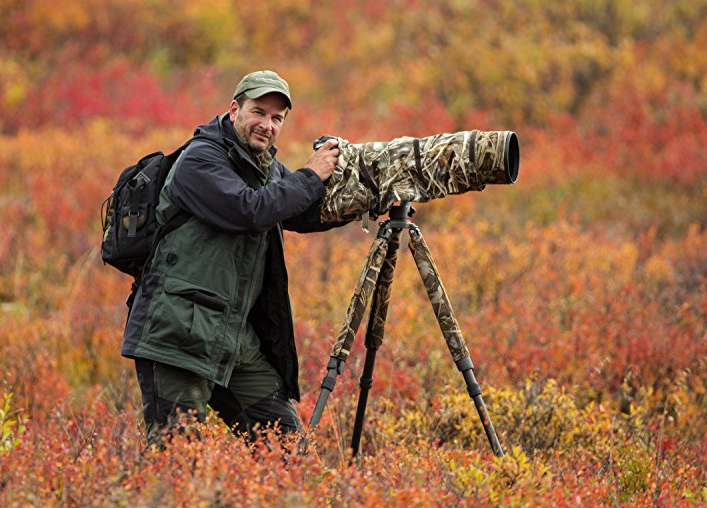 I gather my photography gear and flashlight. The night is cool but comfortable with a slight breeze. I walk back towards the dry creek bed and begin to hike along the bank. Using my flashlight to illuminate the way, I hike up to a small clearing just below a rock wall and the entrance to a large cave. I leave the camera gear and climb up into the cave. The entrance is large enough for me to walk right inside. I’ve come to the mountains of southern Arizona in search of the Ring-tailed Cat (Bassariscus astutus). For many years, I’ve been searching for these elusive nocturnal members of the raccoon family. They are native to the arid regions of North America. They are also called Miner’s Cats or Bassarisks. Sometimes they are called Civet Cats. Unfortunately, all of these common names refer to them as cats, but they are not cats at all. This creature has the face of a fox, the body of a cat, and a very long tail, about the length of its body, with 14-16 dark rings, hence the common name Ring-tail. They have straight, semi-retractable claws that allow them to climb trees and scramble over rocks. The Ring-tails often use a cave for shelter and sleep during the day. I climb back down to my camera gear and set up and get ready for a long night of waiting. I sit down on the cold ground and look up. Above are the branches of a large Sycamore tree, framing an opening to the night sky above and exposing the stars. It’s peaceful and magical all at the same time. After several hours of waiting, I decide to check the cave once again. This time I go farther into the cave, and a solitary bat starts to fly around me. Bats are usually not active in winter at this elevation, so I am a little surprised. Wanting to know what species of bat, I remember that I have a “bat identifier” in the truck. I make the hike back down to the vehicle and grab a tiny plastic device that is no larger than a book of matches. On my smart phone I have a very sophisticated app that interacts with the tiny plastic ultrasonic receiver. I return to the cave and plug the device into my phone and start the app. As soon as I turn on the app it starts to capture the ultrasonic sounds of the flying bat. Of course, I don’t hear anything, but the app translates the ultrasonic sounds into something I can hear. 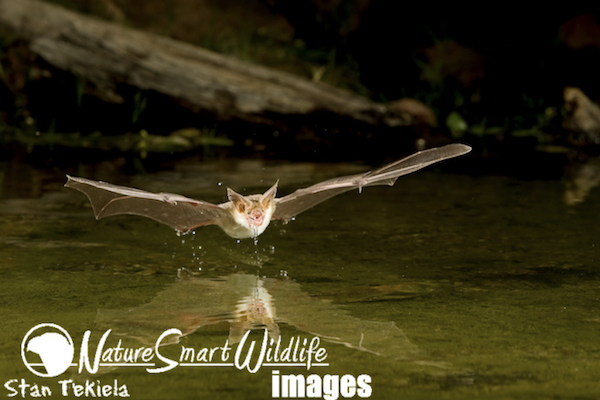 My movement had stirred up some insects, and the bat began zipping past me, scooping up insects just a few feet away. 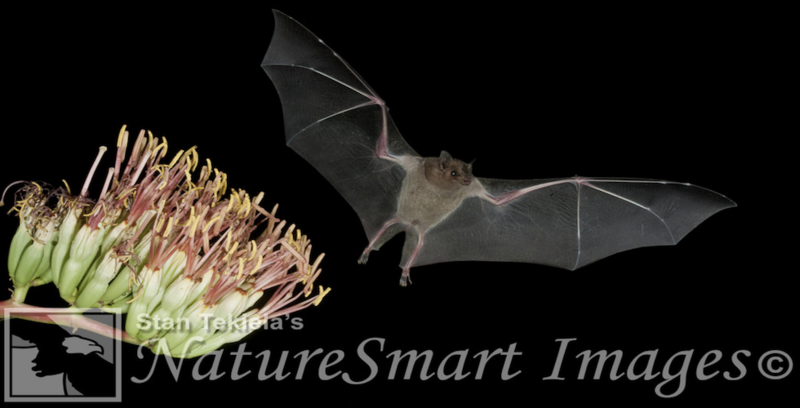 Within a few seconds, the app has recorded the ultrasonic sounds and identified the flying bat as a California Myotis. I am thrilled. In the past, it would have been very difficult to identify the species without catching it and doing a detailed physical exam. After this distraction, I return to wondering about the Ring-tails. At one point I hear something walking slowly through the fallen leaves, but when I switch on my flashlight I only discover a Hooded Skunk scurrying off into the darkness. The waiting is in vain, and the Ring-tails never show up; nonetheless, it has been a great night to be in the mountains of Arizona. If you enjoyed this story about Stan’s encounter with a bat in flight, sign up for our newsletter now!